October was a fun, hectic month of travel and visits with friends. 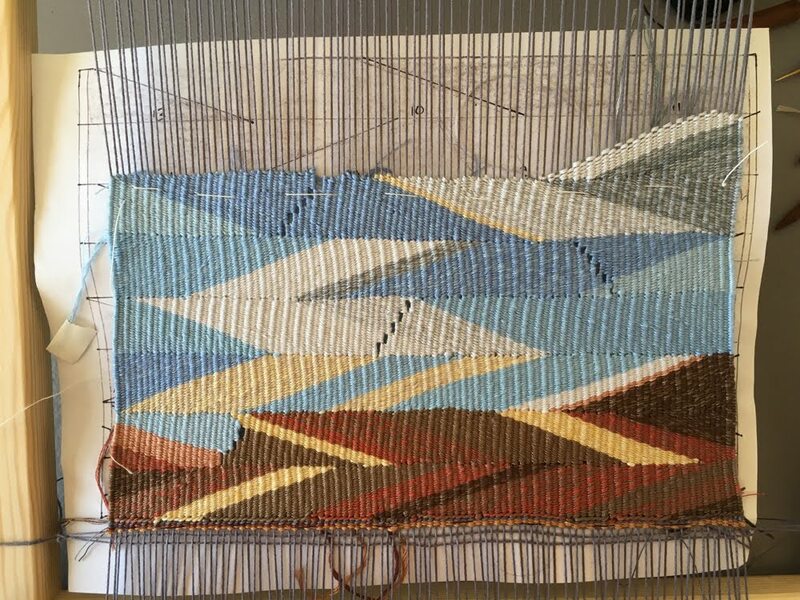 Studio work has proceeded however, in fits and spurts, here and there, and since it's been awhile since I posted about actual tapestry weaving, here's an update. Experimentation and percolating of various ideas continues, in short. 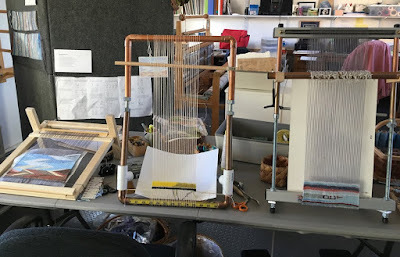 These are the three looms I'm working at these days. I am weaving the wedge weave landscape/sky piece that I had in mind awhile ago, nearly done with that. I'm enjoying blending strands of 6-ply DMC floss. Love that sheen! I'm playing around with small slits, as you can see. Tentative title: Crosscurrents. 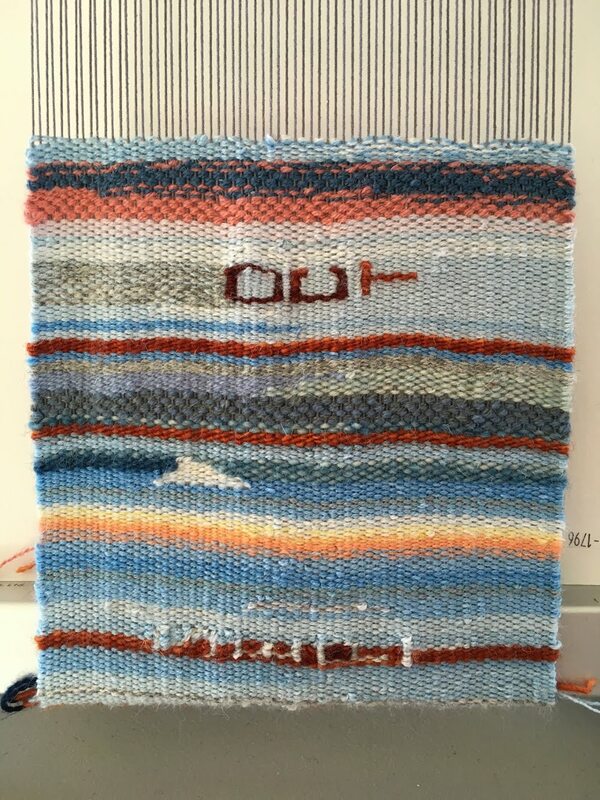 I'm weaving on the Glimakra "small Freja" loom I picked up at Convergence. 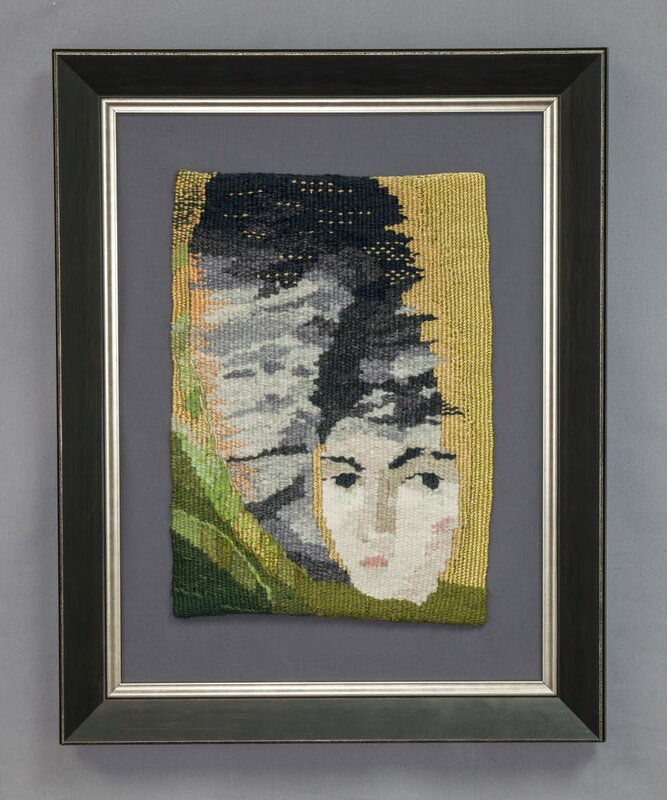 It's a great little frame loom with screws at the top that allow you to adjust tension. But the comfortable weaving area is only about 6" high on this size loom. 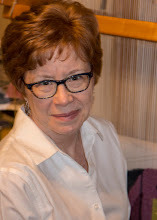 I suspect I will be needle weaving those last several rows. 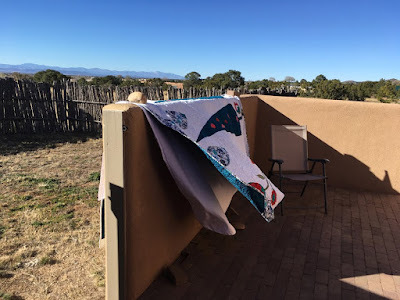 Speaking of classes, I am happy to announce that I am teaching my Collage to Tapestry Cartoon workshop at the Espanola Valley Fiber Arts Center (EVFAC), in Espanola, NM Feb. 22-24, 2019. This is the same class I taught at Convergence this summer, with the addition of a third day for optional weaving/sampling of the cartoon you've designed. 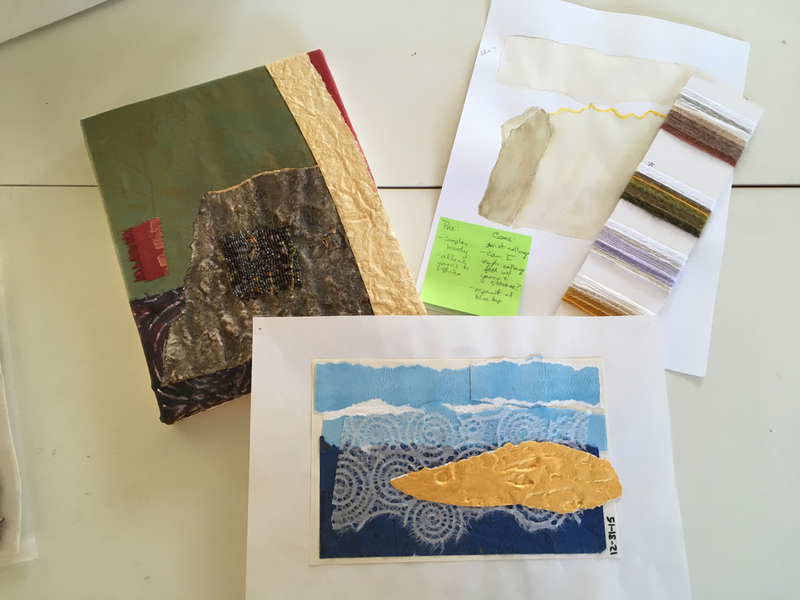 You'll learn to use collage (cut-and-paste) to design your tapestry and how to translate it into a cartoon you can weave. Find all the details HERE. Work on the tapestry diary on the Mirrix continues, with one stripe for each day's sky color (days out of town are orange). I weave the name of each month at the end of the month. And I'm still exploring the potential for collage and mixed media in tapestry . . . and not just in the design stage. I've got a few collages I'm beginning to translate into cartoons, waiting to see which one grabs me and doesn't let go. I have completed one small piece I'm pretty excited about, but I can't show it to you yet as it's in the jurying process for a show. Exciting news! This piece from my Mary series has found a new home with good friends. It's always so gratifying when someone responds so wholeheartedly to to your work. Thanks, Alice and Dave! And . . . faithful readers (with a very good memory) may recall that a few years ago (OK, three and half years) I was inspired by a trip to Istanbul and the chance to view amazing tile work in the Topkapi Palace. 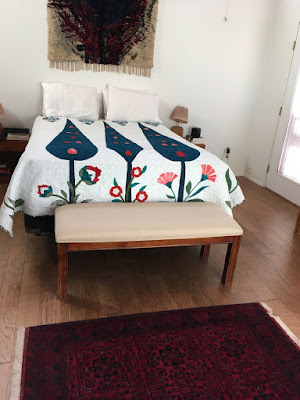 I decided to design and start making a new quilt for our bed, to go with the lovely rug we purchased there. That quilt, drum roll please, is FINALLY FINISHED!!! As in quilted (not by me), the binding sewn on, and washed, dried outside, and put on the bed. Hallelujah. I'm finding the bright white is a bit jarring next to all the off-white tones in the room. Next time I wash it I may tea-dye it. . .